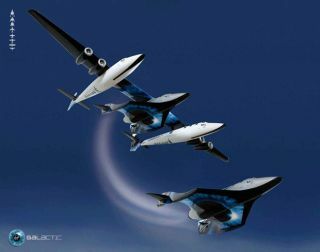 WhiteKnightTwo mothership is the launch carrier for SpaceShipTwo spaceliner under development by Scaled Composites. NASA is studying use of suborbital systems for conducting science as well as astronaut training. ALAMOGORDO, NM — NASA is eyeing ways to use privately operatedsuborbital vehicles to help carry out its space agenda. The U.S. agency appears keen on exploring whatbenefits can be gleaned from commercial piloted suborbital vehicles overtraditional means of hurling payloads on suborbital trajectories to the edge ofspace. The capability, if realized, could offer NASA a new mode of scientific research:human-tended suborbital investigations for studies in which having a live personin-the-loop would increase the scientific return of flight experiments. If it's a go from the space agency, a pilotresearch program of suborbital flight operations could be implemented in2010-2011. The idea was appraised during a 15thanniversary reunion of DC-X/XA experimental pioneers, who tested a verticaltakeoff and landing rocket project run by the Pentagon, the Air Force and NASAat periods of time during 1991-1997. During the mid-August reunion here at theNew Mexico Museum of Space History, meeting participants also dove into futurespace transportation needs. The cadre of private groupsworking on suborbital vehicles is both impressive and growing, such as: ScaledComposites and its WhiteKnightTwo/SpaceShipTwosystem, as well as the Lynxsuborbital rocket plane by XCOR Aerospace. Efforts are also underway atMasten Space Systems, Armadillo Aerospace, Rocketplane Global, and by thatoh-so-secretive Blue Origin group that's bankrolledby Jeff Bezos of Amazon.com fame and fortune. During last month'sgathering, NASAchief Mike Griffin underscored the fact that private groups can nowaccomplish suborbital human space sprees on their own dime. Up to a few yearsago, he added, that ability could only happen using government dollars. When asked about how muchNASA is doing to encourage commercial suborbital flight, Griffin said:"The brief answer is ? as much as I can." The space agency is in theprocess of consolidating money from its sounding rocket program, he added, aswell as drawing dollars from NASA's Exploration Systems Mission Directorate. That cash amounts to no morethan a few million bucks — a symbolic as well as real gesture, Griffin said. Those consolidated dollars will be placed into a funding line for thepurchase of commercial human suborbital flights, he observed. "Those [flights] canhave many purposes," Griffin said. "We spend a good deal of moneybuying suborbital flights at NASA for purely scientific payloads all the time.Some of our best program managers come out of the suborbital program ? becausethat's where they cut their teeth on learning how to fly real hardware." But there's a big differencein flying payloads on private suborbital craft. For one, the human principalinvestigator of the experiment could goalong for the ride. NASA has other interests inbuying rides from suborbital firms. "We could usecommercial suborbital human transportation for early training and qualificationof astronauts," Griffin explained. "If I could buy a seat tosuborbital flight for a few hundred thousand dollars ? why wouldn't we have allof our new 'astros' make their first flight in such a manner?" Still, even with thatencouragement, Griffin launched his own advisory to private space groups. "I also need thecommercial companies to behave like commercial companies, not like governmententities. They've got to figure out what their customers want and give it tothem ? so we've got to get suppliers acting like suppliers. But that willhappen," Griffin concluded. A set of funded studies this fall willidentify, as a first step, the utility of purchasing suborbital services, saidPete Worden, director of NASA's Ames Research Center in Mountain View, Calif."We've got to do the homework," with Ames leading the effort. Worden said one idea has alreadybubbled to the top. Up to now trying to get a handle onhow well astronauts can read cockpit dials in NASA's Orion — the replacementfor the space shuttle — is tacked together via simulations. Alternatively,human suborbital flights could provide all-in-one acceleration intoweightlessness and then reentry forces. In other words ? the real deal. "The question is can itsimulate better, more effectively, or cheaper than other means that we use.That's kind of where we're going," Worden told SPACE.com. There is also a bounty of otherscience missions waiting to be tapped with private suborbital vehicles, othermeeting participants said. "These new vehicles present uswith some great opportunities, both in terms of their capabilities and in thatthey will allow us to conduct research in a new way, by booking commercialservices to reach space," said John Karcz working on the use of pilotedsuborbital vehicles to carry out a portfolio of missions. He is anastrophysicist with the SETI Institute who is located at NASA's Ames Research Center in Mountain View, California. Karcz told SPACE.com thatNASA's first major step has been the call — which is currently out ? forconcept studies using the new breed of suborbital space ships to carry outresearch under the umbrella of NASA's Science Mission Directorate. Disciplines under that wing of NASAare: astrophysics, heliophysics, planetary science, and Earth science. "I am eager to see the ideasfor missions that people develop.There is bound to be some overlap with theresearch currently conducted on suborbital platforms, like sounding rockets.But, I am convinced that the unique capabilities expected from these vehicles —like frequent flights to space, rapid turn-around times, and the ability tocarry the scientists themselves onboard — should open up completely newpossibilities," Karcz added.